Qidwai W, Samani ZA, Azam I, Lalani S. Knowledge, Attitude and Practice of Vitamin Supplementation among Patients visiting Out-Patient Physicians in a Teaching Hospital in Karachi. Oman Med J 2012 Mar; 27(2):116-120. Keywords: Vitamin supplements; Vitamins; Vitamin deficiency. Excessive and inappropriate use of medications has been recognized as a public health problem resulting in an increased likelihood of adverse drug events, drug interactions, and inappropriate drug prescribing and increased costs.15 The hidden and growing phenomenon of vitamin supplement polypharmacy adds a new layer of complexity to patient care and poses a significant public health problem, still largely unrecognized and poorly understood.16 The high prevalence of vitamin supplement use, coupled with the uncontrolled access to such supplements is a cause for concern.17 In a developing country like Pakistan with poor healthcare indicators and weak infrastructure, this issue poses a major economic burden on the healthcare system of the country. To the best of our knowledge, there is limited data available in Pakistan on this issue; therefore, this study was conducted to determine the current knowledge, attitudes and practice of vitamin supplements among the Pakistani population. This is a descriptive cross-sectional study conducted at the family medicine clinics located in the Community Health Centre and the Consulting Clinics at Aga Khan University Hospital (AKUH), Karachi, Pakistan. AKUH is a tertiary care hospital in the private sector. By conducting the study in two different locations, a mixture of participants from both the middle and higher economic communities living in Karachi was ensured. All patients attending their respective family medicine clinics were consecutively approached according to their time and convenience to participate in the study until the final sample size was achieved. However, patients who were below 18 years of age were excluded. Permission to conduct the study was sought from all the concerned clinics. Written informed consent was obtained from the participants after the study protocol was explained to them. The study participants were assured about the confidentiality and anonymity of the information. After informed consent was obtained; face to face interviews were conducted by medical graduates who were specifically trained for the task by the research team. Each interview took 20 minutes. The data was collected from 1st July 2008 to 30th September 2008. A pre-tested and structured questionnaire was used to collect information. The questionnaire was composed of two parts: part 1 included questions on demographics (age, gender, occupation, and education); while the second part of the questionnaire included questions based on awareness of vitamin supplements, its importance, reasons for consuming vitamins and the effects of vitamin supplements (both harmful and desired). To achieve the study objective, at least 400 participants were required. The sample size was calculated assuming the knowledge of vitamin supplements among patients to be 50%, with 5% bound on error and 4% non-response rate. The data was analyzed using the Statistical Package for Social Sciences (SPSS) version 19. Multiple responses were divided into separate sub-variables. The mean and standard deviations (SD) for continuous variables such as age and percentages were reported for categorical demographic variables. Indications for use of vitamins (A, B, C, D and E) among the study participants were calculated and reported separately. The 400 study participants were Pakistanis; about 246 were females (61.5%) and 154 were males (38.5%). The mean age of the study population was 33.35 ± 11.83 years. About 27% of the study participants were single while the majority was married (70.2%). Approximately half (49%) of the study participants were graduates, having more than 14 years of education. Based on the occupation of the respondents, approximately 28.5% were housewives and approximately 13% were doing business. 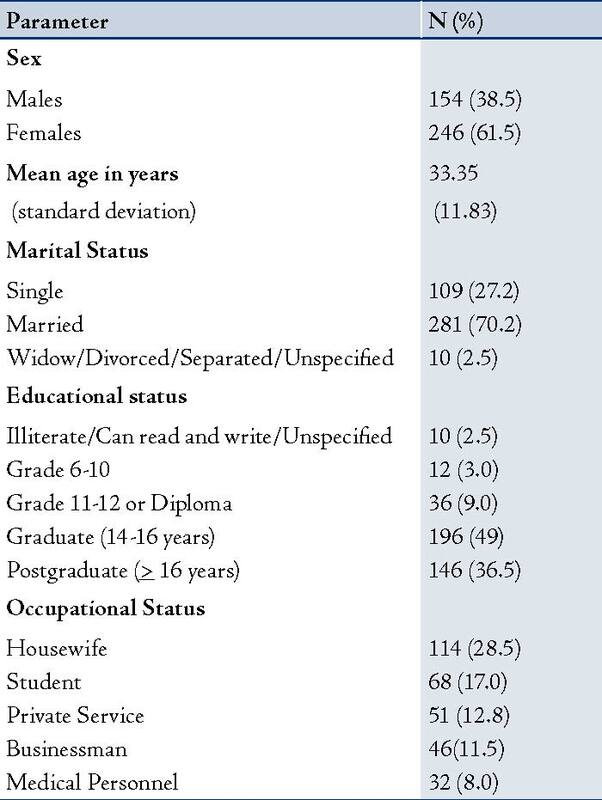 The demographics of the study population are presented in Table 1. Table 1: Demographics of Study Population (n=400). Almost all (98%) participants were aware of vitamin supplements, and the most known vitamin was found to be Vitamin C (16.9%), while Vitamin K was found to be the least known (0.4%). The commonly chosen answer (39.2%) as the main source of information about supplements was found to be Doctors; however, more than half (51.8%) of the respondents were unaware of the harmful effects of supplements. Among the study subjects, 79% of the participants considered supplements to be helpful. The use of supplements as a compensation for deficiencies in the body was the most frequently cited (17.7%) reason for the use of vitamin supplements. The study findings showed that the majority (84.8%) of the study population had taken vitamin supplements, and around two-thirds (66.2%) of the participants took their supplements after being recommended to by a doctor. On the other hand, 41% of the sample population was unaware of the number of times they took supplements; while over half of the study population (56.8%) took the recommended dose of the supplements. The knowledge, attitudes and practices of the study population about Vitamin Supplements are presented in Table 2. Table 2: Knowledge, Attitude and Practices of Study Population about Vitamin Supplements (n=400). Overall, there was a lack of knowledge regarding the indications for use of vitamin supplements, with “Don’t know” being most commonly selected for all questions. Vitamin “A” was most commonly chosen (36.5%) as the vitamin which prevents blindness; while 7.8 of the respondents thought that vitamin “A” should be avoided during pregnancy. For lowering the risk of coronary heart disease, Vitamin "E" was the most frequently selected (10.6%); and 27.9% of the participants selected Vitamin "E" as the vitamin important for healthy skin. On the other hand, Vitamin "C" was the most common vitamin taken for lowering the risk of cancer (12.4%). Vitamin "C" was also commonly taken (12.4%) to maintain the integrity of the immune system. For prevention of flu/cold, Vitamin "C" was most commonly taken; and Vitamin "C" was also the most commonly (14.8%) considered vitamin which should be given during pregnancy. Then again, Vitamin "B" was most frequently taken (11.4%) by patients to prevent numbness or tingling. Vitamin "B" was also the most frequent (14%) vitamin cited for prevention of birth defects. The indications for use of vitamin supplements among the study population are presented in Table 3. Our study showed doctors, friends/relatives and media/newspaper to be the three most common sources of information regarding vitamin supplements. This is consistent to the research by Leah et al. where these were also found to be the three most common sources of information.18 While Annette et al. found that most physicians said they trusted professional journals and clinical studies for reliable information about dietary supplements they recommended to patients. Most physicians indicated they had not received any formal education or training on the subject of vitamin supplements.19 Furthermore, the reasons reported for using vitamin supplements in the study by Leah et al.18 were similar to the reasons reported in the current study, (i.e., to overcome deficiencies, improve general health and to replenish energy). Regarding the frequency of use, 41% of the respondents were unaware of the number of times they take vitamin supplements; while around one-third (35%) of the study population took a vitamin supplement once daily. Similar results were also reported in a study conducted by Mary et al. where 44.6% took one supplement daily.20 This is a particularly important finding as excessive use or over-dosing of vitamins can lead to adverse effects. Excluding the patients who responded “Don’t know” for the above indications, the remaining study population correlated certain vitamins for specific indications; for example: Vitamin “A” prevents blindness, Vitamin “E” is important for healthy skin, Vitamin C improves flu/cold and Vitamin ‘B’ prevents birth defects and numbness. Although no concrete evidence is provided in the literature suggesting these specific indications, health related articles in newspapers and marketing statements have a significant contribution for these perceptions. Patients interviewed in this study were visiting a tertiary care teaching hospital, where the urban and literate population mostly seek healthcare; hence, the results cannot be generalized to the whole population. Nevertheless, this is the first such study to be conducted in Pakistan and can form the basis for further studies and awareness programs regarding the safe and correct use of vitamin supplements. This study has several limitations that need to be addressed. Since the study was a descriptive cross sectional study; the association or correlation between variables could not be studied. Secondly, most of the study participants were highly educated (more than 14 years of education), so their knowledge about vitamin supplementation might be different from the less educated or illiterate population, this may have biased the study results. Thirdly, the harmful effects of vitamins were not specifically raised in the questionnaire. Furthermore, the study was conducted at single private hospital with patients recruited from both general practice clinics/specialty clinics; therefore, it may not be possible to generalize the results of this study since other populations may have different behaviors. This study highlights a very important but neglected area of vitamin supplementation. Since, awareness about the use of vitamin supplements seems to be deficient in Pakistan; we therefore recommend that this should be addressed either by conducting awareness campaigns or educating the general population through media and health professionals. Most importantly, short training sessions/workshops should be arranged specifically for doctors, to educate them as to which explanation/description should be given to patients seeking or requiring vitamin supplementation. In addition, refresher training programs are essential for the continuous improvement of doctors’ knowledge and skills. The results of this study signify that further studies are needed to assess the overuse of multivitamins and the factors related to description of multivitamins by doctors to their patients. We acknowledge with thanks for the participants’ time and information provided for the study. We would also like to thank Mr. Mustafa Saleem for his co-operation and his contribution is gratefully acknowledged. We declare no competing interests in conducting this research or in the publication of this work. 1. Barnes PM, Bloom B, Nahin RL. Complementary and alternative medicine use among adults and children: United States, 2007. National health statistics reports. 2009;(12):1–23. 2. Foote JA, Murphy SP, Wilkens LR, Hankin JH, Henderson BE, Kolonel LN. Factors associated with dietary supplement use among healthy adults of five ethnicities: the Multiethnic Cohort Study. Am J Epidemiol 2003 May;157(10):888-897. 3. NBJ’s Supplement Business Report 2006. [Accessed on: 22 May, 2011]. Available at: http://nutritionbusiness.com. 4. Archer SL, Stamler J, Moag-Stahlberg A, Van Horn L, Garside D, Chan Q, et al. Association of dietary supplement use with specific micronutrient intakes among middle-aged American men and women: the INTERMAP Study. J Am Diet Assoc 2005 Jul;105(7):1106-1114. 5. Gardiner P, Buettner C, Davis RB, Phillips RS, Kemper KJ. Factors and common conditions associated with adolescent dietary supplement use: an analysis of the National Health and Nutrition Examination Survey (NHANES). BMC Complement Altern Med 2008;8:9. 6. Frank E, Bendich A, Denniston M. Use of vitamin-mineral supplements by female physicians in the United States. Am J Clin Nutr 2000 Oct;72(4):969-975. 7. Towheed TE, Maxwell L, Anastassiades TP, Shea B, Houpt J, Robinson V, et al. Glucosamine therapy for treating osteoarthritis. Cochrane Database Syst Rev 2005;(2):CD002946. 8. Anderson JW, Nicolosi RJ, Borzelleca JF. Glucosamine effects in humans: a review of effects on glucose metabolism, side effects, safety considerations and efficacy.Food Chem Toxicol 2005 Feb;43(2):187-201. .
9. Rosenfeldt F, Hilton D, Pepe S, Krum H. Systematic review of effect of coenzyme Q10 in physical exercise, hypertension and heart failure. Biofactors 2003;18(1-4):91-100. 10. Harper CR, Jacobson TA. Usefulness of omega-3 fatty acids and the prevention of coronary heart disease. Am J Cardiol 2005 Dec;96(11):1521-1529. .
11. Willett WC, Stampfer MJ. Clinical practice. What vitamins should I be taking, doctor? N Engl J Med 2001 Dec;345(25):1819-1824. .
12. Fletcher RH, Fairfield KM. Vitamins for chronic disease prevention in adults: clinical applications. JAMA 2002 Jun;287(23):3127-3129. .
13. Tilburt JC, Emanuel EJ, Miller FG. Does the evidence make a difference in consumer behavior? Sales of supplements before and after publication of negative research results. J Gen Intern Med 2008 Sep;23(9):1495-1498. 14. Kennedy J, Wang C-C, Wu C-H. Patient Disclosure about Herb and Supplement Use among Adults in the US. Evid Based Complement Alternat Med 2008Dec;5(4):451-456. 15. Morley JE. Hot topics in geriatrics. J Gerontol A Biol Sci Med Sci 2003 Jan;58(1):30-36. 16. Nisly NL, Gryzlak BM, Zimmerman MB, Wallace RB. Dietary supplement polypharmacy: an unrecognized public health problem? Evid Based Complement Alternat Med2010 Mar;7(1):107-113. 17. Petróczi A, Naughton DP, Mazanov J, Holloway A, Bingham J. Performance enhancement with supplements: incongruence between rationale and practice. J Int Soc Sports Nutr 2007;4:19. 18. Ferrucci LM, McCorkle R, Smith T, Stein KD, Cartmel B. Factors related to the use of dietary supplements by cancer survivors. J Altern Complement Med 2009Jun;15(6):673-680. 19. Dickinson A, Boyon N, Shao A. Physicians and nurses use and recommend dietary supplements: report of a survey. Nutr J 2009;8:29. 20. Picciano MF, McGuire MK. Use of dietary supplements by pregnant and lactating women in North America. Am J Clin Nutr 2009 Feb;89(2):663S-667S. 21. Cassileth BR, Heitzer M, Wesa K. The Public Health Impact of Herbs and Nutritional Supplements. Pharm Biol 2009 Aug;47(8):761-767.